Mt. 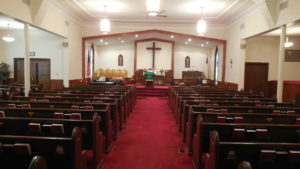 Laurel Church of God has approximately 155 church members. Our oldest member is 99 years of age. Our average attendance at Sunday School services is 50 people and at Worship services 95 people. We warmly welcome all visitors and it will not take long for you to find someone to talk to who will make you feel like family. We hope you enjoy your first experience so much that you will tell all your friends and return again. We welcome your feedback, so please complete a visitor pew card and place it in the offering plate. You can also send us an email, call the office or post a message on our Mt. Laurel Church of God Facebook page. We look forward to seeing you again soon. Parking – We have several parking lots available. One lot is across the street from the cemetery and fire company. The second (smaller) lot is located next to the building lower level, which includes several handicap parking spaces. 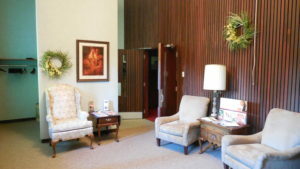 Entrances/Sanctuary – There are several entrances into the church and we have a driveway that leads directly to a side door right outside the sanctuary for those people who may have ambulatory challenges. 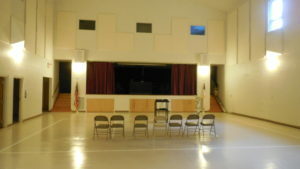 When you enter from the lower level parking lot, you will enter into our large fellowship hall. You can either take the stairs or the elevator to the upper level where the sanctuary and Sunday school classrooms are located. If you enter via the main entrance, you will walk directly into the Narthex, with its comfortable Victorian furniture. There is also an area on either side of the narthex where you can hang your coat. Here you will be greeted by a member of the church and provided with a bulletin listing our worship services for the day, along with services for the upcoming week. If you are a new visitor to the church, you will be offered a tour of the church and any questions you may have will be answered at that time. Dress Code – The only dress code is….that you wear clothes. We are a casual, family atmosphere. The men wear anything from jeans and casual shirt to a suit and tie; some wear jeans with a sport coat and some even wear shorts and sneakers. The women wear anything from dresses, to slacks or jeans/shorts. You may wear whatever makes you feel comfortable. Sunday School – Our Sunday school service begins with a brief devotional time, announcements about weekly services, and a short time of prayer and hymns. Afterward, the adults will proceed to a Sunday school class of their choosing; while the children will go to their age appropriate classrooms. Worship Service – Our blended worship service begins with a praise hymn and prayer; followed by announcements and another musical selection by either the Ladies Ensemble or the Junior Choir. Next, the children are encouraged to participate in the children’s message. A church member will read scripture; leading into the scheduled sermon for the day (which usually lasts 20-25 minutes). Worship is closed with a hymn. Children are welcome during the first portion of our worship service to participate in the Children’s Message. All members of Mt. Laurel Church of God who work with children have had background checks for the safety of your children. See HOME, OUR SERVICES for a detailed listing of what services are offered at Mt. Laurel Church of God.